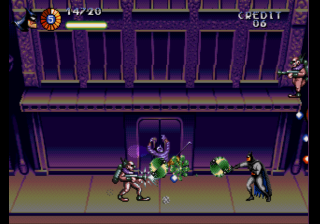 In this modification, Batman’s weapons are always fully charged, which completely changes the difficulty of the game. 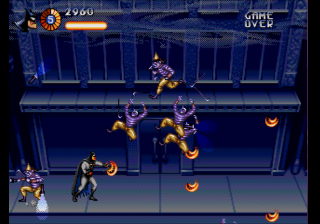 In addition, with five extra lives, it is more than enough to be able to defeat the game without frustrations. Wow! What a difference these two changes make. This game is brutally difficult in its original form, think something like Contra: Hard Corps-level difficulty. 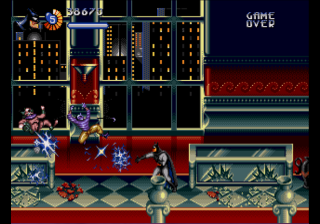 That’s a shame, because this game has some of the most graphically impressive effects to be seen on the Genesis. With the changes to the weapons and increased lives, this game now becomes much more playable and enjoyable. The first time I played this game, I died…a lot. It took me at least 3 or 4 continues before I beat the first section of Level 1, i.e. the first time you fight Harley Quinn. I had to use Game Genie codes to truly enjoy the original game. With this hack, I was able to get to Level 3: Section 3 (the mushrooms) without using a continue on my first play before I had to quit, and I beat the game my second time around without using a continue. Essentially, playing this game without the hack is an exercise in patience and frustration, while playing it with the hack is a nice, relaxing, run-n-gun experience, that still retains some challenge. I MUCH prefer this game with the hack. It’s worth noting that you can still upgrade your weapons with power-ups. This hack just makes it so your weapon’s power meter is always at maximum, which makes the game feel much more balanced. Overall, I highly recommend this hack. Obviously, if you’ve dedicated a lot of time to this game in the past and are an expert, this isn’t the hack for you. 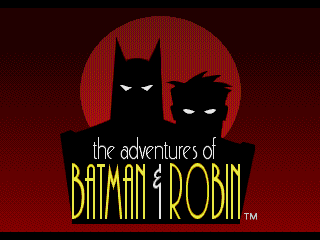 But if you love your retro games and want be able to progress in this game without dedicating hours upon hours to it, this is your jam.